Recent news has highlighted a shortage of teachers trained to degree level in the subjects in which they teach, a situation especially true for the sciences. One solution proposed by education experts was greater encouragement at school level for pupils to consider science as a topic for further study and their careers. 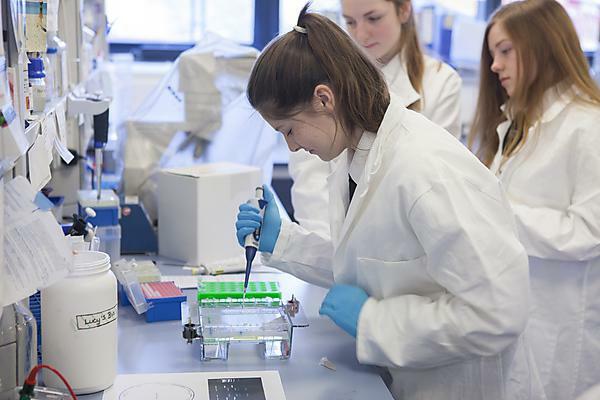 As part of British Science Week, Plymouth University Peninsula Schools of Medicine and Dentistry has opened up its labs to Year 9 pupils from 12 schools in and around Plymouth, so that they could get hands-on in the laboratory and see what it is like to be a scientist. The SoCool for Science event took place at labs on Plymouth Science Park. Pupils met with research students and scientists at Plymouth University Peninsula Schools of Medicine and Dentistry and spent time on science projects, including extracting DNA from living cells (bananas), fruit fly genetics and how they are used as a model for research into human diseases, and cell culture where pupils had a go at culturing some cells. In all, more than 150 pupils took part, from: Plymstock School, Devonport High School for Girls, Notre Dame School, Stoke Damerel Community College, Heles School, St Boniface’s Catholic College, Plymouth High School for Girls, Eggbuckland Community College, Coombe Dean School, Ridgeway School and Tavistock College.